Hino’s new generation 300 Series is as safe a light duty truck as they come. 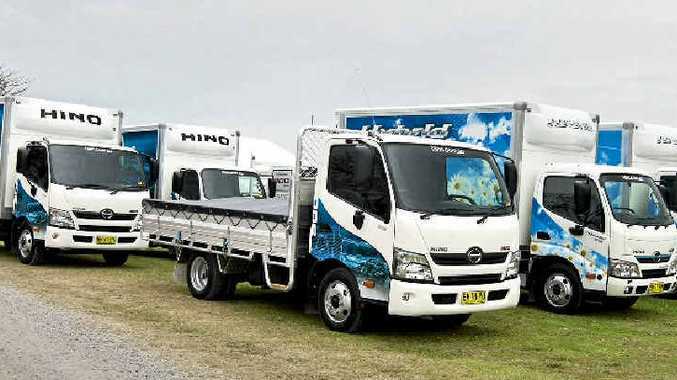 HINO'S new-generation 300 Series claims the title of the safest light-duty truck on the Australian market. It is the first light-duty truck in Australia with vehicle stability control as a standard feature. VSC is an additional layer of safety that assists the driver to maintain control of the vehicle. This system is designed to help prevent the vehicle from skidding out of control should it deviate from the driver's intended path through a corner. Standard passive equipment on all models includes SRS airbags for both driver and passenger coupled with emergency locking retracting pretensioning seatbelts. All Hino 300 Series models have four-wheel ventilated disc brakes with ABS braking and electronic brake-force distribution. Together these technologies ensure maximum stopping power is available regardless of how the vehicle is laden and prevailing road conditions. All manual transmission and automated manual transmission models have Hino's ES (Easy Start) hill-start assist. Easy Start maintains braking force after the driver takes his or her foot off the brake pedal and automatically releases the brake once the clutch engages and the vehicle begins to move. Easy Start operates in both forward and reverse. The 300 Series safety package also includes a front under-run protection system on all wide cabin models for the first time on a light-duty truck. FUPS helps prevent a vehicle from going underneath a truck in the event of a front on collision, while also protecting the vehicle's steering components thereby assisting the driver to maintain control of the vehicle. Hino's 300 Series meets the internationally-recognised European Structural Standards Regulation No. 20 (ECE-R29) for cabin strength. Hino's entire range of light, medium and heavy-duty trucks comply with the ECE-R29 crash test standard. Special attention has been paid to maximising visibility and minimising blind spots. The windscreen pillars on the wide cab models are only 65mm wide, compared with 100mm or more for its nearest competitors. Power-operated and heated mirrors are standard equipment on all models. Up to three rear-facing cameras are available as an option, with the image displayed on the dashboard via a six-inch 2DIN liquid crystal display. Attention to detail in safety features includes a tilt-cab warning lamp on all single cab models. New exterior mirrors have been specified across the range, with a flat main mirror and convex spotter mirror for increased visibility. Hino's new-generation 300 Series has an increased number of model variants in both standard and wide cab, and a greater choice of crew cab models. The entire range has been redesigned inside and out.